Haven WRF is a 2012 Dutch filly by the Hanovarian Stallion Black Tie and her mom is by Freestyle a Florestan son. 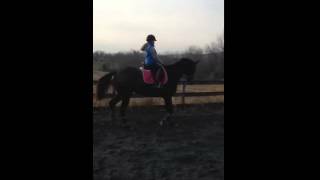 She is started going well under saddle and is fantastic! At only 4 yrs old, Haven WRF has qualified for the East Coast Marerial Championships at Devon! She is truly a Once in a lifetime partner! Although still young, she has the mind of a mature campaigner and has years to showing ahead of her! My 11 yr old granddaughter qualified for the Dressage Seat Equtation Championships with her! She loves people and her work and tries very hard to please. Haven is the Whole Package. She can go from winning her Dressage test to a trail ride, easily taking any jumps along the way. What a Girl! We love this combination so much that we are doing it again this year! Haven is not available until after Devon!